When it comes to learning and development, the modern employee – particularly the modern professional – has very different ideas and ways of learning. This has become very apparent in the longitudinal study I have been running over the last 12 years into the tools for learning. In the survey, learning professionals (and others in related areas) are invited to nominate their Top 10 (digital) tools for learning and their contributions are then used to generate the annual list. From 2007-2015 this was a Top 100 Tools for Learning list, but to mark the 10th anniversary of the project in 2016, the list was extended to 200 tools, and since that time 3 sub-lists have also been created in order to help identify the context of use for each of the tools. The 2018 Top Tools for Learning 2018 list was published on 24 September 2018. Below you can find them displayed in a clickable infographic. The Top 100 Tools for Personal & Professional Learning infographic appears on page 2. For modern professionals, learning is not something that happens just in education or training but happens in many different ways every day both inside and outside work. All of which is shown on the diagram below. Modern professionals also learn for many different reasons – not just because they have to – to become competent, conformant or compliant in their organisation – but because they want to, for their own personal and professional reasons. Here are some of those reasons mapped onto this diagram that also shows the frequency of learning and where it takes place. Whilst organisationally, most initiatives are about designing and managing content and courses for intermittent training, for modern professionals, learning is a personal, continuous process – and at work it mainly takes place in the workflow – as they do their daily job. 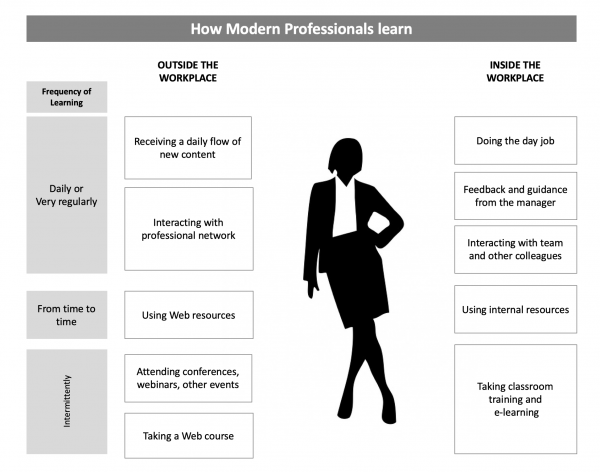 But, which of these ways of learning bring modern professionals the most value? That question is answered on the next page.